It’s been a long time coming but I eventually have my hands on one of these Essential units, as they slide away into unpopularity with the announcement that the company will not be making an updated version and that when Android Q arrives on this one, it’ll be end of line. Not surprising then, that people are offloading them and retailers are knocking them out for pocket money, particularly in the USA, often in Flash Sales. But this doesn’t detract from the fact that this is still a terrific phone, with bang up-to-date software and very much a good investment for the next two years. I’m putting this 2017 model up here against the Pixel 2 (2017) and Nokia 8 Sirocco (2018). They are similar sized devices, generally, with similar specs in many departments and all three have fast-track claims to the latest versions of Android as they are released. In other ways, as we’ll find out here, they are very different from each other, but at release at least, they were all three in the same ballpark in terms of price and market pitch. The Essential is beautifully made, with nods to iPhone SE and OnePlus X. The ‘boxy’ design is very much like the iPhone and ceramic back just like the 1+X. The front is protected by Gorilla Glass 5. It’s gorgeous in the hand and screams quality. At 185g it's substantially weighty and the titanium framework oozes class. The metal buttons around the side and ports on the bottom are industrial standard and everything the hand can touch is totally premium. Unusually, the SIM Card Tray is on the bottom along with single speaker and USB-C Charging port. The Pixel 2 is made of glass and aluminium and Sirocco, glass and steel. In terms of build and design I guess it’s horses-for-courses, like a lot of subjective stuff going on here, but for me, even taking into account the lovely ‘boxy’ titanium and ceramics of the Essential, the Sirocco wins because it’s just interestingly ‘shaped’ with beautifully premium features around the body, curves aplenty. The Pixel 2 comes in third as it’s just, well, frankly, a boring slab with no real design language or personality. All three have a fingerprint scanner on the back, in pretty much the same place, and they all work like lightning, both in setup and use. The Nokia and Pixel 2 benefit from IP67 water/dust protection, unlike the Essential, which is another missed trick. The 5.71” 19:10 IPS LCD screen has a notch at the top in order to make the device near bezel-free but it’s not the same ‘wide’ notch that most other bandwagon-jumpers have adopted, rather a very narrow, deep cut-out, right in the middle around the front-facing camera. It actually feels much better than what has become the industry-standard ‘notch’ because it’s much smaller and in time, really is not noticed by the user. The 1312 x 2560 (504ppi) screen otherwise goes right out to the edges, at least top and sides if not bottom. There’s a quarter-inch ‘chin’ at the foot, but I’m OK with that - somewhere to rest the thumb. There is, however, something odd about the LCD panel which I don’t think I’ve seen before and that’s uniform horizontal lines right across it when you look close enough - and you have to look really closely using a torch! I’ve tried to research that but apart from people agreeing and suggesting, no formal explanation. The other two devices sport OLED screens, the Sirocco having a nasty ‘blue’ cast around the (gorgeous) curves, when the phone is even the slightest bit tilted and screen is white. It’s apparently made by LG which, given what we know about the Pixel 2XL, fits with the scene. 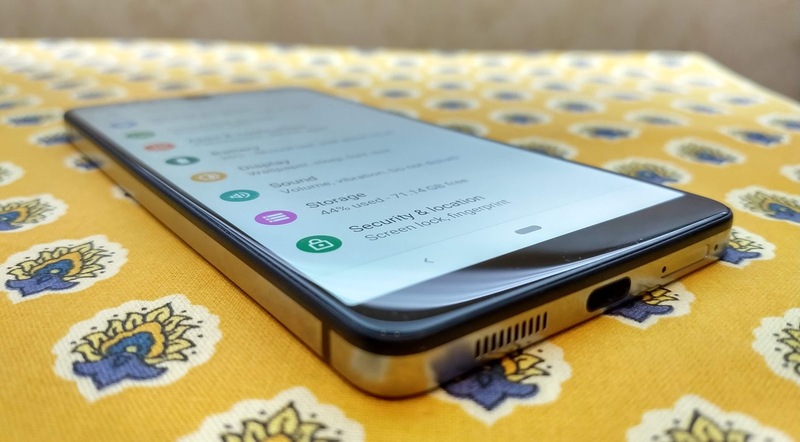 The Pixel 2’s screen, however, show no cast at all and is clearly a superior panel. All three devices have super-bright screens and the user would be pleased with any of them over time, if they like blue! And don’t look for those lines! I was very disappointed to discover that the Essential Phone had no Glance/Always-On screen at all. No double tap to wake. Only lift to see the clock and notifications briefly. Unlike the other two which both have true Always-On displays, the Sirocco winning out with more options and graphics than even the Pixel. Though it should be noted that the Pixel wins out with the music recognition always-listening function - Now Playing. That, I have found really useful very often. The Essential Phone was released last year with Nougat, then updated very promptly with Oreo before anyone else got there except Google, then on the day that the Pixel devices were served up with Pie, sure enough, Essential users got the same privileged treatment. Android 9 with September 2018 Google Security here, making it every bit as good as a Pixel. All the benefits of right up-to-date software are not to be sniffed at, with the promise of exactly the same thing when Android Q arrives. It’s almost worth the money getting one of these in, as it would be a first generation Pixel, for that feature alone. Kudos to Essential. The Pixel 2 clearly steams ahead of all else here, being most tightly tucked under the wing of Google, though the Sirocco is an Android One device which means sharp and well timed updates coming along. As I write it has 8.1 and September Security but I’m expecting Pie any minute. But yes, a win for the other two here. One annoying minus point here for the Essential was the pre-installed Amazon Alexa App. Probably as it was sold for the American market, and easily uninstalled, but annoying just the same to have one blip on the otherwise Vanilla landscape. The Essential shipped with the Snapdragon 835, like the other two here, and that’s perfectly good still. Spec Purists will boast and argue for their SD845 devices but this is a terrific chipset which flies through multiple tasks, is battery efficient and benefits even more from the help from Google’s Pie software tweaks. All three of these units have 128GB of storage space and no microSD Card slot, so that’s what you get. Even though more storage is always better, armed with 128GB I really think that’s enough for most people who are not serial videographers or collectors of large amounts of films and music to use when offline or not wanting to pay for data (like me)! There’s 4GB RAM too, to assist with keeping stuff open and switching between tasks for the Essential and Pixel 2. In a world where the Sirocco’s 6GB is becoming more like the standard and just last week a device announced with 10(!) you could be forgiven for thinking that 4GB is meagre, but it’s not! Android very happily runs with 4 and you won’t notice the difference, as I don’t when I switch to my Razer Phone with 8GB. The 3040mAh battery is bigger than the Pixel 2’s (2700) but smaller than the Sirocco’s (3260). I have an irrational paranoia about small batteries, I have to admit, even though in truth I’m never long away from power somewhere - irrational because actually, having tested all three of these phones for longevity they are all very good for a medium-to-heavy day of use with no fear of not getting to bedtime. Of course you can kill the battery by thrashing it, but I’m talking about in general use. The Sirocco is ahead of the others here with Qi charging built-in and it really is very handy for many people. To be honest, I find that since I semi-retired and don’t sit at a desk all day, the benefit to me is diminished. I have a charger by the bed but when I place the phone on it I am often wondering if, when I move in the night, the quilt might knock it off the perch. But it is, at least, slow charging which will elongate the life of the cell. The Essential’s main camera is a 13MP f1.9 unit with a secondary depth/mono lens, 8MP f2.2 Selfie round the front and no OIS anywhere. The camera interface is basic with little control via menus, though it does have the obligatory Portrait Mode (which seems to work as well as any other) making use of that second lens and slow-mo option via video. The test photos and video that I’ve shot are perfectly good, as usual, for that 95% of people who are not pixel-peeping or making posters and posting to social media. If you want an in-depth analysis on the camera quality, head for YouTube where it’s been done to death. Sorry - but I’m not really that interested in cameras on phones until they are much better and can challenge stand-alone options with bigger sensors. The other two phones here outclass the Essential’s camera, however, even for me! As we all know by the great press that the Pixel cameras are afforded, the Google software is a step ahead and although the camera may not have all the manual bells and whistles of an LG phone, or even the very capable Sirocco here, it can’t be touched by most others just now. So if pixel-peeping photography is your thing, pass by the Essential and get a Pixel. There’s a single speaker, as I said, bottom-firing. And it’s OK, a little tinny but reasonably loud. It’s as good as the Sirocco’s and perfectly good enough for casual listening, audiobooks, podcasts and spoken word. If you want to play music seriously, you’ll need to invest in headphones or ‘bluetooth’ the sounds to another device. There’s a dongle in the box to get your 3.5mm headphones connected to the USB-C port. Regular readers of my clap-trap will know that at this point I usually say that most phones sound terrific via my reference headphones - but wait! 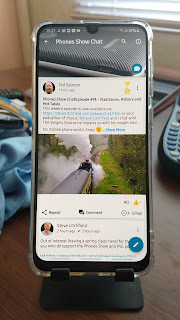 The output from this Essential Phone, though sounding really good in terms of quality, really isn’t very loud even with the volume racked up to maximum. Plugging into the Sirocco straight afterwards reveals that shortcoming very clearly as the Nokia blows the sock off of it for volume. I accept that the Nokia has 24-bit DAC output, but I didn’t expect the difference to be that marked. Similarly the Pixel sounds better via this medium, so another reason to not prioritise the Essential on that pick-list - particularly if quality audio recording is your thing as the Nokia streaks ahead with OZO-in-4K video audio surround recording. If it is, then it certainly is a differentiator. The OZO sounds stunning and can’t be emulated on YouTube or any other medium - you have to hear it for yourself with your own ears to be blown away! Lastly, the Pixel 2 has stereo speakers, front-firing, which you don’t get with the other two. Having said that, as I’ve mentioned before, the benefit of stereo on a tiny pocket-sized device has to be questionable. OK - as we get up to Pixel 2XL size, moving the phone at least a bit further from the face, I can buy it more, but you might as well really have a great sounding speaker than a mediocre attempt at stereo, spoiling the potential total output, which I think the Pixel 2 does. Like the Sirocco, the Essential is a beautifully made piece of phone-jewellery! It’s so lovely in the hand that it seems criminal to case it. I did think that the ceramic back would make it really slippery, but it doesn’t seem to do so - nothing like glass - so you could get away with not casing it in that respect. The Sirocco, no! It’s like a pebble. The biggest factor here, overriding all of the above is that the Essential Phone can be picked up for a song, it has already got Pie running with a promise of Q straight away too. Maybe a ‘poor man’s Pixel’ but when mid-range devices are coming down in price, we have to have an eye on money and whether or not it’s worth paying that 400% premium on buying price of a posh device for 10% more/better features/performance. At this price, with these specs and such gorgeous build it’s a no-brainer for most of us. Highly recommended.